Let me know using the "Contact Us" page if you find this blog useful. You can purchase a pdf archive of all previous blog entries for only $1.99 by using the 'Add to Cart' button to the right. Visit Lulu.com to check out Trading Truths, the best of the PMKing Trading Blog. Use the Contact Us section of this site if you want to receive this Blog as an email every time it is published, or if you simply enjoy reading it and want to encourage me to continue to write it. Discuss this blog on the PMKing Trading Forum. blog, noun, an online journal, diary, or collection of thoughts; shortened form of web log. As disciplined traders we should always be on the lookout for low-risk, high-reward opportunities and I have a great one for you today. I recently gave a one hour presentation on the areas of trading that I believe are key to success and it was recorded and turned into a webinar by Norman Hallett for part of his "Disciplined Trader Basics Program". Don't be fooled by the "Basics" in the title - this is practical, useful, and important information for traders with any level of experience and background. The "high-reward" part is that my one hour webinar is only about one quarter of the material in the program. The "low-risk" part is the fact that Norman (as always) is offering a 100% money-back guarantee if you don't think the program is worth the price he's charging. All you have to risk is a few hours of your time and a temporary charge on your credit card! This information is for PMKing Trading coaching clients who have developed a complete US Equity Trading program and should not be construed as a recommendation to enter any positions. In my next few blog entries I'm going to focus on some common trading myths that everybody seems to propogate as true, but in reality there is little use in them even if there is a grain of truth there. I'm sure you can add another 10 or so items to this list of things that everyone tells you is true but you've never really tested or thought about in any detail. If there are some ideas you've always wanted to know the truth about, or how they can be useful to your trading, shoot me an email and I'll give you an opinion on it right here in this blog. What makes prices move, Part II? "Let’s have a little quiz about price movement. Imagine a company that issues 100 shares and each of them is purchased at the IPO for $1 each by 100 investors. All the 100 holders of the shares are unwilling to sell at any price and just want to hold onto the shares for the voting rights they bestow." I'll now give you my take on the 5 questions and answers and also the implications for your trading. What will the price of the shares be if there are no buyers? Since there are no sellers and no buyers there will be no market for the shares and therefore no price. This tells us that prices cannot move without participants willing to buy and sell at the same time. What will the price of the shares be if buyers put in limit orders? Since the sellers are unwilling to sell at any price it doesn't matter what price buyers put on their limit orders - there will be no willing seller at that price. This tells us that prices cannot move unless there are both buyers and sellers willing to trade at the market. What will the price of the shares be if one person decides to sell but for a price higher than the current highest buy limit order? If the only seller requires a higher price than the current best bid then no trade will take place. This tells us that for prices to move there must be someone willing to trade at the market price. What will the price be if one person decides to sell at the market price? If someone is willing to sell at the market price, then the price will move to the current best offer price. This tells us that price moving is about participants being willing to trade at the market price. What will the price be if there are always 100 people willing to sell at the market price and simultaneously 100 people willing to buy at the market price? If there are equal numbers of buyers and sellers at the market price then the share price will not change - the shares will change hands at the same price. What this tells us is that price moves are caused by a disequilibrium in the current volume of buy and sell market orders. So in summary, prices move because of a temporary imbalance in the number of buy market orders versus the number of sell market orders. Therefore, trying to predict future price moves is like saying it's possible to predict when more market participants will put in buy or sell market orders at any particular point in time. If you consider all the factors taken into consideration that may cause someone to hit the "buy" or "sell" button in their account it becomes pretty obvious that it's not predictable or able to be modeled in an accurate way. This is the reason that trading methods that rely on predicting future price moves and being correct more than 50% of the time will always fail in the long run. The next tick is related to the previous one but depends on how the balance of buy and sell market orders has changed - and that's just not realiably predictable. It’s ironic that all of trading is about price moving since we can’t make a profit unless price moves in some direction, but most traders when asked the question “what makes price move?” can’t come up with a simple and elegant explanation in one sentence. Some say it’s to do with supply and demand, and others to do with an imbalance in buyers and sellers, but the ideas behind their answers are usually somewhat “fuzzy” to say the least. Let’s have a little quiz about price movement. Imagine a company that issues 100 shares and each of them is purchased at the IPO for $1 each by 100 investors. All the 100 holders of the shares are unwilling to sell at any price and just want to hold onto the shares for the voting rights they bestow. Question 1: What will the price of the shares be if there are no buyers? Question 2: What will the price of the shares be if buyers put in limit orders? Question 3: What will the price of the shares be if one person decides to sell but for a price higher than the current highest buy limit order? Question 4: What will the price be if one person decides to sell at the market price? Question 5: What will the price be if there are always 100 people willing to sell at the market price and simultaneously 100 people willing to buy at the market price? · Using the lowest cost broker to minimize trade implementation costs so that they do not outweigh potential trading profits (especially for high-frequency trading). · Being well organized and disciplined so trading implementation errors are minimized. Implementation errors can be the difference between a nice living and a total financial disaster, especially when you are first starting out trading. · Using sophisticated historical trading system testing software to make sure your system or method is positive expectation in many types of market, and should definitely make money over longer periods of time and many trades (assuming accurate implementation of course). · Keeping yourself healthy, alert, and happy so you can accurately implement your trading program. There is no point having a great trading program if the biological part of your bio-mechanical trading machine (i.e. you) doesn't work properly and is the weak link. · Providing yourself with a fixed income that pays your expenses that is not dependent on your trading results so that you can trade without fear of losing. Trading "scared" money is setting yourself up to fail, because you cannot tolerate the normal draw-downs (and irregular income) that any trading method generates. In short, if you don't have a relatively long list of decent, well-defined trading edges, then your odds of success are minimal; you'll simply be providing the profits for the traders who do have an edge, know what it is, and aren't afraid of exploiting it. In this 80 minute INO TV presentation, Ron Shelton, a quantitative analyst/risk manager, explains the use of game theory and its application to risk taking in trading. Using some real-world examples such as nuclear proliferation and earthquake insurance, Ron explains how a payoff matrix can be constructed with probabilities and risks. Next, a simple trading game is played to indicate how taking more or less risk on a particular occasion and where stops are placed is key to understanding your trading results. It’s refreshing to have a discussion of exits rather than entries as the most important aspect of a trading program although Ron does not specifically make this point. My observation was that every participant got different results even though they all had exactly the same entry time and price. The last part of the presentation involves some detailed equations and graphical representations of one possible (over-simplified due to time constraints) application of payoff matrices to trading. By no means a comprehensive coverage of game theory in respect to trading, but should definitely give any intelligent trader a few avenues for further study and research that will pay dividends when applied to their trading program development and evaluation. This is the first time that a complete and current Global Market Perspecitve has been offered free and it's too good to miss. Hurry - offer ends this week - click here for details, you won't find this offer on their site. This article is part of a syndicated series about deflation from market analyst Robert Prechter, the world’s foremost expert on and proponent of the deflationary scenario. For more on deflation and how you can survive it, download Prechter’s FREE 60-page Deflation Survival eBook, part of Prechter’s NEW Deflation Survival Guide. The following article was adapted from Robert Prechter’s NEW Deflation Survival eBook, a free 60-page compilation of Prechter’s most important teachings and warnings about deflation. It may sound crazy, but suppose the government were to decide that the health of the nation depends upon producing Jaguar automobiles and providing them to as many people as possible. To facilitate that goal, it begins operating Jaguar plants all over the country, subsidizing production with tax money. To everyone’s delight, it offers these luxury cars for sale at 50 percent off the old price. People flock to the showrooms and buy. Later, sales slow down, so the government cuts the price in half again. More people rush in and buy. Finally, the country is awash in Jaguars. Alas, sales slow again, and the government panics. It must move more Jaguars, or, according to its theory — ironically now made fact — the economy will recede. People are working three days a week just to pay their taxes so the government can keep producing more Jaguars. If Jaguars stop moving, the economy will stop. So the government begins giving Jaguars away. A few more cars move out of the showrooms, but then it ends. Nobody wants any more Jaguars. They don’t care if they’re free. They can’t find a use for them. Production of Jaguars ceases. It takes years to work through the overhanging supply of Jaguars. Tax collections collapse, the factories close, and unemployment soars. The economy is wrecked. People can’t afford to buy gasoline, so many of the Jaguars rust away to worthlessness. The number of Jaguars — at best — returns to the level it was before the program began. It may sound crazy, but suppose the government were to decide that the health of the nation depends upon producing credit and providing it to as many people as possible. To facilitate that goal, it begins operating credit-production plants all over the country, called Federal Reserve Banks. To everyone’s delight, these banks offer the credit for sale at below market rates. People flock to the banks and buy. Later, sales slow down, so the banks cut the price again. More people rush in and buy. Sales again slow, so they lower the price to one percent. People return to the banks to buy even more credit. Why not? Look how cheap it is! Borrowers use credit to buy houses, boats and an extra Jaguar to park out on the lawn. Finally, the country is awash in credit. Alas, sales slow again, and the banks panic. They must move more credit, or, according to its theory — ironically now made fact — the economy will recede. People are working three days a week just to pay the interest on their debt to the banks so the banks can keep offering more credit. If credit stops moving, the economy will stop. So the banks begin giving credit away, at zero percent interest. A few more loans move through the tellers’ windows, but then it ends. Nobody wants any more credit. They don’t care if it’s free. They can’t find a use for it. Production of credit ceases. It takes years to work through the overhanging supply of credit. Interest payments collapse, banks close, and unemployment soars. The economy is wrecked. People can’t afford to pay interest on their debts, so many bonds deteriorate to worthlessness. The value of credit — at best — returns to the level it was before the program began. Is the analogy perfect? No. The idea of pushing credit on people is far more dangerous than the idea of pushing Jaguars on them. In the credit scenario, debtors and even most creditors lose everything in the end. In the Jaguar scenario, at least everyone ends up with a garage full of cars. Of course, the Jaguar scenario is impossible, because the government can’t produce value. It can, however, reduce values. A government that imposes a central bank monopoly, for example, can reduce the incremental value of credit. A monopoly credit system also allows for fraud and theft on a far bigger scale. Instead of government appropriating citizens’ labor openly by having them produce cars, a monopoly banking system does so clandestinely by stealing stored labor from citizens’ bank accounts by inflating the supply of credit, thereby reducing the value of their savings. Initially it would take a few years longer for the same number of people to own houses and cars – actually own them, not rent them from banks. Because banks would not be appropriating so much of everyone’s labor and wealth, the economy would grow much faster. Eventually, the extent of home and car ownership – actual ownership – would eclipse that in an easy-credit society. Moreover, people would keep their homes and cars because banks would not be foreclosing on them. As a bonus, there would be no devastating across-the-board collapse of the banking system, which, as history has repeatedly demonstrated, is inevitable under a central bank’s fiat-credit monopoly. For more on deflation, download Prechter’s FREE 60-page Deflation Survival eBook or browse various deflation topics like those below at www.elliottwave.com/deflation. And much more in Prechter’s FREE Deflation Survival Guide. Robert Prechter, Chartered Market Technician, is the world's foremost expert on and proponent of the deflationary scenario. Prechter is the founder and CEO of Elliott Wave International, author of Wall Street best-sellers Conquer the Crash and Elliott Wave Principle and editor of The Elliott Wave Theorist monthly market letter since 1979. In Gladwell's latest book "Outliers" the subject is success and what the main causes of it are. The book is an interesting and informative challenge to the conventional wisdom that IQ is predictive of success and only the most intelligent people can truly succeed. As in Gladwell's previous works, Blink and The Tipping Point the writing is clear, easy to understand, and engrossing. It takes an estimated 10,000 hours of "practice" to really become an expert in anything, and those who are successful end up with a unique opportunity to gain those 10,000 hours quicker than the average person. If you truly want to be successful in any chosen field then this book points you in the right direction and can help to avoid situations where you're set up to fail simply because the opportunity to become an expert simply isn't there for you. In my previous blog entry I described how I managed to have an instant -1R losing trade (which I'd previously thought could not be possible). After the initial anger at my computer, trading software, system, broker, exchange and everything else, I've had time to reflect and see what I learned from this. Firstly this clearly demonstrates the usefulness of a "small size real-money" testing phase in your trading program development plan. If I'd been trading $10 million dollars with a 1% risk per trade, that mistake would have cost me $100,000 in about 10 miliseconds. Also important is a paper-trading phase using your broker's demonstration account (your broker does have a demonstration account to allow you to test their software first don't they? If not, find a new broker!) to make sure the mechanics of your trading program implementation are completely understood. I did have a paper-testing phase, but unfortunately all the limit orders were not round numbers so they already had the required 2 decimal places so they executed properly. Secondly, it's very important to allocate blame correctly here. I typed in the order, I chose to use Interactive Brokers, I chose to trade instruments on an exchange that has an 8 minute trade "bust" window, I chose to phone my broker up rather than use their electronic trade bust request system (which they specificaly recommend using to avoid the situation I got into if i'd bothered to investigate this before starting to trade this system). If I blame the trading software, my broker, the exchange, or anything else other than myself I'm not going to learn anything from this and probablly make bad decisions. If I blame the exchange and their 8-minute bust window I would not be able to trade the SOS system at all since that's where most of the instruments I want to trade are listed. My loss. If I blame my broker, I'd be forced to move my accounts to an inferior broker (IMHO) since I did a lot of research to make sure I was trading using the best broker currently available for the instruments I want to trade. My loss. If I blame the trading software, I'd be forced to stop using it and phone in orders every time I wanted to execute a trade. This would create far more potential for errors than my current method of 100% electronic trade entry and management. My loss. Unless I take personal responsibility for the mistake I can't learn from it, put things in place to prevent it happening again, and continue trading in the most efficient way I possibly can. This has been my policy from the very start of my trading carreer and I believe it has allowed me to excel as a trader more than any other fundamental decision I have made regarding my trading business. There are an infinite number of diverse, new, and interesting ways to screw up your trading. Make sure to take responsibility for them when you cause them to happen and you will eventually make (and learn from) enough mistakes to consider yourself to be competent. This is what experience is and it's how good traders get to be good. Take responsibility for your actions and you will have an edge over everyone who just blames something or someone else for their mistakes. Yesterday I had my first instant -1R loser ever. (1R is the initial risk on the trade determined by where your initial stop is). If you're familiar with the concept of using an initial stop to determine R then you'll be wondering how it's possible to actually generate an instant -1R loser. I didn't know it was possible until yesterday so I thought I'd write a blog entry about it. I've recently finished developing a trading program that is short volatility by selling out of the money options on futures contracts. I call it the "short option strangle" program or SOS for short. Fortunately I'm in small-size real-money testing at the moment to see if there are any implementation "problems" (exactly like the one I encountered) before risking any "real" capital on the system. I got a signal to short a Gold futures strangle. The price for the combination was about $4.5 bid, $9.30 offered (spreads are relatively wide with these options) so I put a limit order in for $9 for the combination hoping to be filled on a short-term volatility spike. Imagine my surprise when the sell order was filled immediately! I checked the trade execution report and was horrified to see my fill price had been 90c not $9. This represented an immediate loss of $840 per contract (based on the current offer price of $9.30 for the combo - each $1 price move represents $100 for this futures option). The trade did not show up as the last traded price for the option contracts in my real-time data feed so I knew something was going on. I called my broker (Interactive Brokers). I was on hold for about 10 minutes before I got through to someone. I explained the situation and they told me that since I'd typed in 9.0 instead of 9.00 for the limit price, it had been interpreted by the exchange (GLOBEX) as a limit price of 90c. I told them that was a) insane, and b) way outside the current bid/ask anyway, and c) hadn't shown up as an executed trade in my data feed. I asked them to "bust" the trade since it was clearly erroneous. The rep said he'd investigate and call me back. About 30 minutes later I got a call back. Apparently the exchange has a "no bust after 8 minutes" policy so the trade would stand. All they would do was to agree to change the price to $3.50 rather than 0.9c. This reduced the loss from $840 per contract to $580 per contract. As you can imagine, I wasn't really thrilled by this concession. After another 10 minutes of arguing with the rep I realized there was nothing I could do - the broker blamed the exchange for not busting the trade, the exchange blamed the broker for not asking for a trade bust within 8 minutes, and I was wasting my time arguing about it. So what can we all learn from this? That's the interesting part and I'll be writing about that soon. I've recently been warning my financial advice clients to make sure at the very least they have no more than $100,000 in any one FDIC "insured" account. This is so that they don't fall foul of the 50c on the dollar loss that IndyMac Bank depositors recently sustained for deposits over $100,000. Reports are that the IndyMac Bank meltdown cost the FDIC up to $8 billion of its $52 billion insurance fund. At that rate it can only afford to bail out another 6 banks before there's no more cash left to pay with (wonder what happens then?). How would you feel about a life insurance company that only had enough cash to pay out on 6 of its insured client's life insurance policies? Most of us think the term "deposits" mean funds that you deliver to the bank for safekeeping, but for nearly 200 years, the courts have sanctioned an interpretation of the term "deposits" to mean a loan to your bank. Combine that fact with the latest headlines you’re reading about big name banks needing bailouts and you have a rude awakening of just how unsafe your bank may be. Get expert, informed, and independent information on what you can do to protect your money, right now. Elliott Wave International, the world’s largest market forecasting firm, has just released a free report, Discover the Top 100 Safest U.S. Banks. Stop worrying about your money and get expert information on what you can do to protect it. My Amazon Kindle, which I've been using for almost all my reading since I got it in November 2007 has just undergone its first real "stress test" and it failed miserably. I'm not happy. OK, so I don't think it was designed to survive being driven over by a Toyota Tacoma truck, but at the current price of $359 (which is $40 less than the original price of $399) I'd still expect it to be near bullet-proof. Anyway, it's a testament to Kindle's usefulness and appeal that I'm actually going to buy another one immediately because I can't live without it any more. I suppose one advantage of a traditional book collection is that it's unlikely to be driven over, and the books would probably still be OK even if it was. Despite this problem I still think the Kindle is the best thing to happen to the written word since the printing press was invented. Get yours here, but remember that the thing is flimsy and can't survive being crushed by even a relatively small pickup truck. UPDATE: I just found out that Kindle's 12 month warranty covers accidental damage too, so Amazon will replace it and even pay for the shipping to return the flat one to them. Now that's rare customer service! UPDATE 6/4/8: I now have a new Kindle and all content has been restored like I never broke the old one (in less than 32 hours). I'm a happy Amazon customer :-). The beta version of the online trade simulation and analysis product "All Systems Go" is up and running and has been updated with new functionality. If you haven't already used it, you can try it out here. The User Guide has now been written and is available here. The Version History for the product is here. Thanks everyone for their useful and constructive feedback about the initial version of the product. Please send any bug reports, comments or feedback using the 'Contact Page' on this site. If you want any help interpreting the results of a simulation please send me an email. Please bear in mind that while the product is in beta testing (and free to use) I have limited resources to answer questions. The beta version of the online trade simulation and analysis product "All Systems Go" is now released. The thumbnail to the left shows part of the example output from the simulator. Simply plug in a sample of real or hypothetical/historical trades and press the "Simulate" button to produce a simulation of the variability of your trading, and also an analysis of the quality of the trade sample. A lot of time in trading is spent (I'd say wasted) looking for so-called high probability entries, but what exactly does that mean? Generally it's trying to identify patterns in price/volume/fundamental/economic data that identify when there is a detectable bias to the future price trend of a tradable instrument. 1. Over what timeframe is this future directional bias supposed to operate? If it's significantly less than your estimated average trade duration then what real use is it? 2. For every positive/reinforcing example of your high probability entry how many negative examples are there? If this pattern only manifests itself in a small amount of data, or price moves counter to the predicted direction in about 50% of the cases, then is there really a cause/effect or predictive relationship going on at all? Once you've programmed your system/pattern and have a nice looking historical equity curve then, leaving everything else the same (i.e. instrument selection and ranking, position sizing, exit strategy), reverse the entry signal and see how this affects the results. I've yet to find a long/short "high probability entry" that doesn't provide similar results when it's reversed leaving everything else the same. What does this tell me? Entry signal does not determine trade winning percentage or winner size - exits and position-sizing do that, so the term "high probability entry" is really an oxymoron to me. What a particular pattern is really determining is a) the entry frequency, and b) whether you're getting into a tradable instrument that's moving about or stagnant. Neither of these has anything to do with what happens next in any particular trade. However, obviously a pattern that generates more entries in instruments that are moving right now has a better chance of capturing trends (in either direction) than one that generates less signals, or signals in instruments that are "stagnant" as far as price movement goes. Stop "wasting" time on entry patterns and start working on position-sizing and exit strategies and you'll see an immediate positive effect on your trading. Am I fit to trade today? It's all too easy, once you have a well-defined trading method, or a few months (or even years) of experience behind you to get complacent and start thinking you're a mechanical trading machine that never makes any errors. Forgetting that trading is a difficult activity to do accurately, consistently, and repeatedly without making any serious implementation errors can lose you many month's worth of profits in a single error. Does anything hurt or ache? Is anything mentally bothering you? Are you ready and happy to go to the office? Do you feel alert and ready for the day? I tend to simplify these questions into a daily "score" and then have some rules about what I can and can't do depending on how low (low is bad) my score is. For example if I don't score high enough then I may decide to simply manage existing positions rather than putting on any new trades. This means I'm not making important decisions when I'm not feeling 100%. Obviously your fitness score can, and should, be changed as you go through your daily morning routine. Sometimes, a little tiredness just needs a good hot shower to fix it. Or some slow breathing when you get to the office may improve your mental state. The important thing is not to be expecting full performance if you're not 100% fit. It is OK to suspend trading if you're at a disadvantage mentally or physically that can more than eliminate any trading edge you have when you're 100% fit. If you keep a diary of your "fitness score" versus any implementation errors you make then it should be relatively easy to see how your error rate increases as your fitness score decreases and then you can implement rules about how to reduce your trading activity when your fitness score is not high enough. If you're trading when not fully fit you simply increase your chances of making an error, and that is the root cause of failure for traders that do have a complete and effective trading method already defined. Don't take the risk, it's not worth it. Recently a trader I know made a small typographic error that cost him nearly $100,000 in 8 minutes and it could have been much worse. Instead of buying a couple of hundred shares of something, he entered an order for over 100,000 shares. This was because the order entry platform he used defaulted to a size of 100 and he didn't replace it with his required order size, but added his order size to the end by mistake. 1 He was tired, so shouldn't have been trading at all. 2 He was on the phone at the same time as entering orders, causing a distraction and a loss of concentration. 3 He didn't check the order confirmation immediately after he'd entered it. 4 It was right before the close, so it was too late to get out of the position when the error was detected. 5 He did not know how to participate in the end-of-day auction process to possibly exit the position immediately (this was not a US trade). 6 The market was very volatile (compounded by the large exit order) the next day so slippage was big. 7 He over-estimated the liquidity available at the open the next day and assumed that he would have similar slippage on exit to what had occurred on entry. 8 He entered a market order for the whole position instead of scaling out or using limit orders. 9 He did not know how to enter a pre-market auction order to exit the position with less slippage. 10 He didn't have a written plan for what to do in the event of this kind of simple trading error. One mistake that he didn't make was that he exited the position as soon as he could. Keeping the position (that was 50 times bigger than intended) to "see shat happens" could have turned into the kind of situation that puts you out of the trading game for a long time (if not permanently) rather than costing you a couple of month's profits. 1 Have a written contingency plan for every problem you can think of. 2 Have rigid procedures for why, how, and when you will put trades on and take them off (and follow them on every trade). 3 Analyze, record, and quantify your mistakes and put things in place to reduce the chances of them happening again. 1 Have a method of evaluating whether you are "fit to trade" and if not, have someone else you can delegate the trading to, or even suspend trading for a while until you are fit. 2, 3, 4 Have a written checklist for trade entry (including confirmation that the correct trade was placed) and follow it on every trade. Don't trade right before the close since you won't have time to fix any mistakes when they do happen. 5, 6, 7, 8 & 9 Always fully understand the dynamics, personality, and mechanics of your chosen markets before you start trading. 10 A full written business plan, operational plan, and contingency plan for your entire trading business is essential if you are going to avoid making mistakes that can easily overwhelm any positive expectation of profit from your trading programs. "..in the very long run, your results at the poker table will approach the sum of your opponents' mistakes, less the sum of your mistakes". You are never in control of your opponents' mistakes in trading, but you can try to ensure that the "sum of your mistakes" is a very small number and in doing that you will greatly increase your chances of success. It's hard to believe that it's been 7 months since I've had the time to post to my blog, but I've been a little busy developing a suite of trading programs for a US-based hedge fund I'm helping to launch for a UK client. If you want more details about that then please use the "Contact" page or shoot me an email. For those of you that would like a nice summary of the previous blog entries I feel are most valuable and informative, I've published them in a little paperback called "Trading Truths" which contains all the best blog entries I've written since I started it in 2002. It's only available from Lulu.com right now since I haven't puchased an ISBN for it yet. In other news, look out for an article in Futures magazine by me in the March 2008 edition and, you never know, I might just find a few minutes to do some more blogging here in the near future. I've also been working on whether trend lines are actually useful in trading and part of that work includes some code that constructs automatic trendlines (in TradeStation) and I've included that below for your information. The chart shows the "persistence" of trends in liquid US equities over the last 20 years. A trend is defined as an X times the Average True Range over Y days move over Z days. The price is then inspected time T days later to see if it was up or down. The number of times the price had moved in the direction of the trend was then counted for 300 different parameter combinations of X, Y, Z and T.
As you can see from the chart, overall there is no trend persistence in the US equity market since the winning percentage for all the system instances tested clusters around 50% (i.e. random chance). 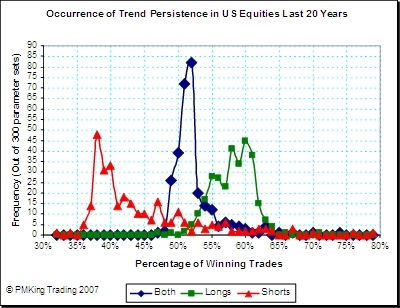 What is interesting is the big difference between trend persistence of up trends versus down trends. Trend persistence in an upward direction is much more prominent than that in a downward direction. Some of the difference can be explained by the "survivorship bias" in the data set used in that the best down-trending equities (i.e. the ones that went bankrupt) are not included. However, the significantly difference results in downward trend-persistence indicates that there is a fundamental difference between the way that prices trend up and down (for US equities anyway). This asymmetry must be understood, accounted for, and adapted to in your trading method if you attempt to trade both long and short. 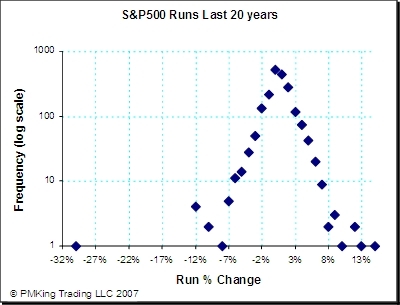 The chart shows the frequency and size of runs in the S&P 500 over the last 20 years. A "run" is defined as a consecutive daily move in the same direction from close to close. For example, if the S&P500 moved +1% then +2% then +0.5% on 3 consecutive trading days, that would be counted as a run of +3.5%. There are a couple of things worth noting about this chart. One is that there are more severe outliers to the left, which means that more significant runs occur on the downside when markets crash. The other is that the distribution is not the normal bell shape that indicates that it is normally distributed. The frequency and size of moves (especially on the downside) are too great and too frequent to be "normal". The number of runs around -12% should not exist and the one at nearly -32% should have almost a zero probability (if price moves were normally distributed). The higher frequency of the "outliers" to the left and right of the chart are referred to as "fat tails" and mean that "all bets are off" when it comes to estimating the size and frequency of market moves using regular statistical and mathematical models that assume a normal distribution (also called a bell-shaped, or Gaussian distribution after the German mathematician Carl Friedrich Gauss). Unless you know what objectives the trading system or method was designed to meet, how can you tell if the achieved performance is good or not? Achieving high returns with low drawdowns is not necessarily indicative of a "sound" trading method - it's likely to be due to luck, or trading methods where the small risk of a very large "blowup" just have not manifested themselves yet. Return is only useful in the context of risk (e.g. drawdown). Most sound trading methods have a return that is similar to the maximum normal drawdown. Look at the largest drawdown ever in relation to the annual percentage return to give you an idea of risk-adjusted return. Margin or leverage can be used to trade at a size that bears little relation to the actual amount of cash available. This can distort any percentage return figures or drawdowns. It's the ratio of the two that's important not the absolute percentages. How many implementation errors are being made? If you have a fully defined method it should be possible to determine how the actual return differs from the theoretical "perfect" return if you made zero implementation errors. A sign of good trading is a gradual reduction in the number of implementation errors as the method matures and the trader becomes experienced at implementing it. Volatility of returns is normally more important than the absolute percentage returns. Achieving consisted returns is often better than bigger, but more volatile returns, to most traders and investors. Any trading method will take a number of years to exhibit the true overall performance characteristics inherent in it. Looking at small samples over only a few months is not representative of most trading methods, especially those that take a small hidden (but non-zero) chance of a huge loss. There's more to trading results than compound annual growth rate, and one needs to do a detailed analysis of the trading behind the numbers to really draw a conclusion about what "good" looks like for any particular set of performance figures. Trend following is a well known, widely used trading method, that goes into and out of favor like the wind. Critics, academics, and traders alike either swear by it or discount it. What is it about trend following that means it works at all? Why trend following works is closely related to why it's psychologically hard to stick to. With a low winning percent (usually around one third of trades) it means you get to be wrong a lot. This may be demoralizing if you're more concerned with being right than making money. Loser after loser can mount up and feel like the proverbial "death by a thousand cuts". Months or even years can go by with nothing to show for your trading discipline except a smaller account balance. All this for an infrequent huge boost from a small percentage of outsized winning trades that come along just after you've given up thinking you'll ever have a winner again. But you kept trading anyway because you like the pain right? This profile of lots of smallish losers interspersed with a few massive winners is exactly what makes trend following so hard, and also makes it a successful strategy. To ride big winning trades you need wide stops, way outside the daily noise, and outside the inevitable two or three ATR reversals that most good trends contain. Wide stops means smaller positions (if you risk a similar amount on each trade). This means you are less prone to a huge hit from prices gapping straight through your stop. It also means trend following is pretty boring as trading goes, so if you're in it for the excitement you won't last long either. All in all, trend following can be a very lucrative and successful strategy but only if you're psychologically adapted to the pain it can inflict on the inexperienced trader. There's no gain without pain, and trend following can be financial agony if you're not mentally prepared for it. In my previous blog entry I outlined briefly what pairs trading is. In this blog entry I'm going to discuss some of the main assumptions that this trading method is based on so you can make a decision about whether it's a good idea or not for you. The correlation between the 2 instruments in a pair is permanent, stable, and long-term (at least for the life of your trade). This is a big assumption. Correlated price movement between 2 instruments is not predictable. It could be due to random chance, it could be due to a fundamental reason that may change. It could be a genuine correlation that will persist for the life of your pairs trade. Beware choosing pairs that look like they are correlated but don't have a fundamental reason why they should be - it could just be random chance. Correlated pairs like the one described in assumption 1 exist. If you cannot find liquid instruments that exhibit correlated behavior then this whole method cannot work. There are times when the spread between the 2 correlated pairs is "much larger than average" and represents a profit opportunity. If the correlation between the pair is "too perfect" there will never be times when the spread is wide enough to give a decent profit by taking the trade. This is a paradox of pairs trading - you need to find pairs that are closely correlated on a permanent basis, but not all the time! You are able to short the side of the pair that is going down. Since a pairs trade is long one instrument and short the other, if you can't put on the short side of the trade then it's no use finding pairs. This can be a particular problem for equity pairs trades where the short side of the trade is not available for borrowing from your broker, and does not have actively traded put options as an alternative. The pair does actually revert to the mean spread and you take your (small) profit. What if the "permanent" correlation between the two instruments has broken down and they will not "revert to the mean"? You will have 2 positions that can both go against you. Where do you admit that the trade is not working? How much is the loss compared to the potential for profit? Overall when one looks at the underlying assumptions of pairs trading it seems like a lot of things have to be true for it to work as a viable trading method. Also with the small profit targets and tight stops the position-sizes tend to be very large in order to generate a decent return. This can lead to a single large adverse event losing the equivalent of many, many, winning trades. My advice would be to carefully evaluate the suitability of this method for your own trading purposes before risking any cash. Assumptions are a big part of trading and understanding what assumptions a particular trading method is based on is a key part of trading success. Some trading methods assume (and attempt to benefit from) trends or momentum of price movement while others assume some kind of "mean reversion". Understanding which camp your trading methods fall into is an important concept. 1 Find two instruments that have a close correlation of price movement (i.e. they generally move up and down together). 2 Determine what the variability of the "spread" between the prices of the two instruments has been historically by either dividing the price of one by the other, or deducting the price of one from the other. 3 Identify when the spread is above average (i.e. the prices have moved wider apart than normal). 4 Go short the instrument that has moved up and long the instrument that has moved down. 5 Capture the profit when prices "revert to the mean" i.e. the spread returns to "normal". There are a whole bunch of assumptions that underlie the success of this trading method and in my next blog entry I'll discuss them and give you my opinion on whether they are useful assumptions or not. Putting this all together to create a complete and sound trading plan that meets your objectives and suits your personality is not something that most people find easy to achieve without expert help. This is the primary reason for trading failure in my opinion and why finding someone who can help you before risking real cash is usually a good idea (in hindsight of course). Most people know that Lexus is owned by Toyota and that there are a lot of common parts including the chassis on some Lexus models. Would you pay up for a Lexus if all they did was slap a different Logo on a Camry and hike up the price? That's what you're doing if you buy "ringer stocks" as I call them. So what is a "ringer stock"? It's the financial world's equivalent of a beat up old Camry dressed up as a brand new Lexus. All major exchanges have minimum listing guidelines for the price of a stock. For example the price of a NASDAQ stock must stay above $1. If it drops below $1 the company may be de-listed from the exchange and be relegated to the oblivion of the "over the counter pink sheet" market. So, what should you do if your business is going nowhere, your stock price is sub-$1 and you're going to be de-listed? Easy, slap on the Lexus badge and carry on like nothing happened. How do you do this? A reverse stock split and a name/ticker symbol change, that's how. Everyone has heard of a stock split where you get, say, 2 shares for every one you currently own, and each one is worth half the price (like cutting a cake in two). A reverse split is where you end up with less shares outstanding, and each one is "worth" more (like gluing the pieces of a cake back together). A NASDAQ stock trading at 0.90c that does a 1 for 10 reverse split is suddenly trading at $9 per share and can avoid de-listing assuming the market capitalization is above $5 million. The historical prices for the stock get adjusted for the split (i.e. multiplied by 10 in this case) and if you change the ticker symbol (and the company name for good measure) at the same time there's no way to even know that the split has taken place just by looking at a regular stock chart. Hey presto, you look just like a Lexus rather than a beat up old Camry and the good old general public (who didn't see the reverse-split/name change news) are none the wiser. Nice trick if you can pull it off. If optimization is the answer, what's the question? Optimization of your trading systems is a very tempting thing to do. If there are enough degrees of freedom (parameters) in your trading system then lots of fiddling and testing different combinations of values for those parameters will yield virtually any results you are likely to want. As long as you have enough historical data to test on, you can find an "effective" version of your trading system to trade it. This approach is completely flawed by the simple fact that given enough data, and parameter settings, the results you observe are completely due to chance. Randomness can observe very compelling patterns if you have enough data and enough tests. So, is optimization useless? In my opinion, no, but it is very dependent on a) the way you interpret your results and b) exactly what historical data you use and c) the degrees of freedom in your trading method. 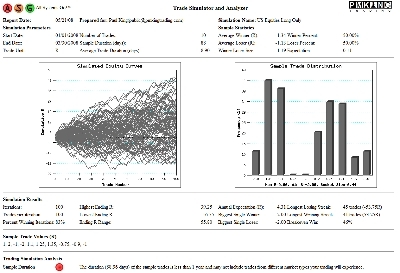 I recommend taking historical testing results and simulating the variability of returns they could produce rather than simply taking the single equity curve generated as your answer to "what your trading method looks like". Simply changing the ordering of the trades you get can significantly affect the equity curve produced. Also, don't optimize on you whole data set and then expect the future to look like the past. At the very least optimize on half of your data and then see how performance differs using the other half. A better way would be to create synthetic data streams for your source data and apply your system to those rather than use the actual historical data. This is beyond the scope of a simple blog. Additionally, the fewer degrees of freedom your system has, the less prone it can be to curve fitting. Most of my trading systems have very few (one or two) actual configurable parameters that can be optimized. Lastly, remember that net ending equity is not the only characteristic of your trading system you can optimize for. What about trade frequency, average winner size, average loser size, equity curve volatility, maximum drawdown? These are all features of your trading system that may be as important to you as actual net return. A sound trading idea does not have to be endlessly "tweaked" for optimum performance; it should work within your requirements for a large range of possible parameter values. Tradecision is a very comprehensive trading system design, testing, simulation, and execution software package that has more features than the average systematic trader will ever need. As with all trading software it's the things it can't do that are most revealing and the list for Tradecision is quite small and relatively insignificant. It doesn't have global variables that are available in each section of the trading strategy so you would have to write a custom dynamic link library (DLL) to achieve this. A running total account value is not available in the custom position sizing section so you can't program a percent-risk position-sizing model (although this feature I'm told will be available in future releases). Data Manager - quickly and easily retrieves historical data from multiple data vendors and timeframes. Neat Scan - a filtering and scanning tool. Strategy Builder - fully-functioned trading strategies defined using a programming language "Improvian". Simulation - a comprehensive strategy back testing feature. Execution - ability to automatically send strategy orders to Interactive Brokers. As well as these major functional areas there are other tools to handle streaming versus real-time data, a neural network model, and facilities to call external code/programs using the dynamic link library (DLL) module. There is also comprehensive online help and most features are accessed using "wizards" and structured dialogues rather than having to learn the programming language immediately. This allows a novice user to utilize the built-in functions easily, but is also flexible enough for the advanced professional user. The familiar bell curve, or Gaussian distribution that is the foundation of many economic, financial, statistical, and mathematical models in use today works perfectly for applications where huge outliers (far from average) events don't exist and each individual event has little effect on the overall average. An example would be the distribution of heights for homo-sapiens. One will get a lovely bell curve where many people cluster around the average height and proportionally less occurences of individuals as you move above (taller) or below (shorter) the average. You will never suddenly come across someone of zero height or 20 feet tall. Taleb goes into forceful, irreverent, and interesting detail to show that life just doesn't work like the standard models assume, and that it is basically very foolish to rely on them or anyone who makes predictions or manages risk using them. It probably would have been even more interesting to see the "uncensored" manuscript before the publisher/editor made their changes. This book does cover some of the same ideas as Taleb's previous (excellent) effort Fooled By Randomness. It is probably due to the commercial success of that book which allowed Taleb the latitude to write The Black Swan without "pulling any punches" and articulate what he really thinks about the established academic, modeling and prediction businesses (especially in economics and finance). A very interesting, entertaining, insulting (for various academics) and eye-opening read that should change the way you look at a bell curve, standard deviation, and any "expert" predictions in the future. View the other non-trading books I recommend here. Weather today in Middlebury Vermont as of 8:54 AM EST is cloudy. Rain so far today is 0.5 inches, snow or other precipitation is 0.25 inches. Temperature is 25 degrees Fahrenheit. Five day forecast is from 0 to 10 inches of rain, 0-24 inches of snow, temperatures between -5 degrees F and 65 degrees F.
What does this all have to do with trading? Well I go about trading the same way that I would construct a weather "forecast". All we know is what price is doing right now, what it's done in the past, and then expect it to do something similar in the future based on current estimated volatility. This tells you the likely range of price of a move (but not the direction). Picking the next "big winner" is not effective, or even possible for a chaotic system like a market of stocks. So if stock-picking isn't the answer, what is it that makes money? Having a good exit strategy that keeps losers small relative to winners, and position-sizing to prevent you exceeding your maximum desired drawdown. That's what makes the money. Then, assuming you trade liquid instruments, it doesn't really matter what happens next - you'll capture some part of things that trend and keep your losers as small as possible. Unlike weather prediction, it doesn't matter if you're wrong more than you're right as long as the size of the winners is bigger than the losers overall and you can tolerate the length and duration of your draw-down periods. Luckily for meteorologists there is no formal feedback process that tells them how good (or bad) a job they are doing unlike trading where your monthly brokerage statement doesn't lie. What exactly does an 50% chance of rain mean - you should take half an umbrella out with you? Maximum historical drawdown is a useful piece of information to calculate for a particular trading method, but it only gives you a very one-dimensional view about how much risk you are actually taking with a particular trading method. If your trading has a "short option" profile, like the metaphorical "picking up nickels in front of a steam-roller", then historical maximum drawdown will completely under-estimate the size of potential losses going forward. Returns could appear consistent and drawdowns tiny, but this does not take into account the small risk of a catastrophic loss these trading methods represent. Additionally, even if your trading has a trend-following, "long option" profile, it is the variability of results that is important in setting your position-sizing, not just the single largest historical drawdown. Simply getting your trades in a different order can make a huge difference on the maximum drawdown. Rather than look at the historically largest peak-to-trough drawdown in my trading systems, I prefer to use simulation to discover a likely range of equally possible equity curves. This can then be used to position-size to stay within my tolerance for risk, and will hopefully give me a more accurate estimate of "what bad looks like" than a single drawdown figure. No single measure of a trading system can capture all relevant information regarding your requirements for performance, trade frequency, and risk so don't put too much emphasis on one behavior of your trading method to the exclusion of the others. Some trading methods are in the markets they trade 100% of the time. These kind of systems use a so-called "Stop and reverse" (SAR) method where the exit of one trade is the entry of the next trade (in the opposite direction). An example would be entering long when the price crosses above a moving average and short when it crosses below. 1 Any financial instrument is not suitable for trading all the time. There will be periods where there is lower volume, lower volatility, and conditions are just not suitable for entering (or even remaining in) a position. SAR techniques do not allow you to be "out" when conditions are not suitable for your method. Just like most mutual funds! 2 Although many techniques can be suitable as an indication to get into a trade, this does not automatically guarantee that the same time is a good place to exit an existing position. Getting long when a price crosses above a moving average is a reasonable way of determining a trend has started and "hopping aboard". Just because the price has crossed back below a moving average does not necessarily mean it's a good time to a) exit the trade, and b) enter a position in the opposite direction. 3 SAR techniques can have unsuitable, or undefined, exit points at the time you enter the trade. If price has just crossed a moving average, for example, your initial stop (if you will exit when price goes back through the moving average) could be very close to the current price. This could cause multiple "whipsaw" losses if price oscillated back and forth around the average. 4 If your entry/exit is a combination of various indicators it may not be possible to estimate where your exit and reversal point will be in advance. This makes it difficult to manage risk and position-size effectively. I'm sure some traders utilize SAR techniques very effectively, but I don't use them and prefer to have completely separate methods for entering and exiting a trade. After all, they are completely separate components of your trading system, so why should they be "optimized" together into one decision? Testing entries with random exits? There has been some recent discussion on the trading forums I frequently read about random entries and exits. Here is my opinion on this subject. I believe that an entry's predominant characteristic is setting trade frequency and entering trades at times where there is the least chance of stagnation of price movement and most chance of continuing high volume. This helps to minimize slippage and also reduces the chances of a "flat line" trade that uses up capital, takes risk, and achieves no return. If there is any predictive nature to entries in any market, one has to think about the likely time period over which the entry pattern is predictive of future prices. If this time period is shorter than the average duration of trades, it is practically insignificant to your overall trading results. I would/could consider trading a random entry assuming it was chosen from a liquid universe of instruments and I had the choice whether to take the trade or not. I would never consider trading a random exit under any circumstances. This to me indicates my beliefs about the relative importance of entries and exits. Other traders may have a different opinion. Attempting to test an entry by using some kind of random, fixed-bar exit is not really representative of real-life trading. Further, a fixed bar random exit basically takes unlimited risk between entry and exit - price could go anywhere and you would not exit. This overestimates the returns of any trading method compared to "real" trading where one normally limits risk during the trade in some way (unless you want to blow up your account at some point). Broker selection, liquid instrument selection, setup, entry, exits, and position-sizing all combine to create a particular instance of a trading system. In my opinion setup/entry influence your trading results the least out of all components, but that doesn't mean they have zero effect. Trade frequency is much more important in my opinion than some short-term predictive anomaly associated with an entry. I know this goes against the grain with most traders, but isn't that what the fabled "search for the holy grail" of trading is about - finding so-called "accurate" entry signals? Since I believe that winning percentage is determined by exits not entries, "accurate entry signal" is an oxymoron to me. Testing trading methods as a consistent "whole" that most closely matches the way you are going to trade for real is an effective approach that does not put too much or too little emphasis on any one trading component. My trading system component model is a useful model, but it's not the only way to think about how trading methods fit together. Examining the effects of changing individual components of a trading method often yields useful (and counter-intuitive) results. Try reversing the side (long or short) of an entry signal for a compete trading system leaving everything else in place, and see what effect that has on the overall expectancy of the system. The results may surprise you. If you find this Blog useful and informative then please make a donation so I know I should continue to publish it. You can purchase a pdf archive of all previous blog entries for only $9.95 by using the 'Add to Cart' button to the right. Are you interested in referring customers for the blog archive to us and earning a 50% commission? See the details of our affiliate program here. Information and thoughts contained in this blog should not be construed as financial advice or a recommendation to enter into any type of securities, futures, or foreign exchange transaction.